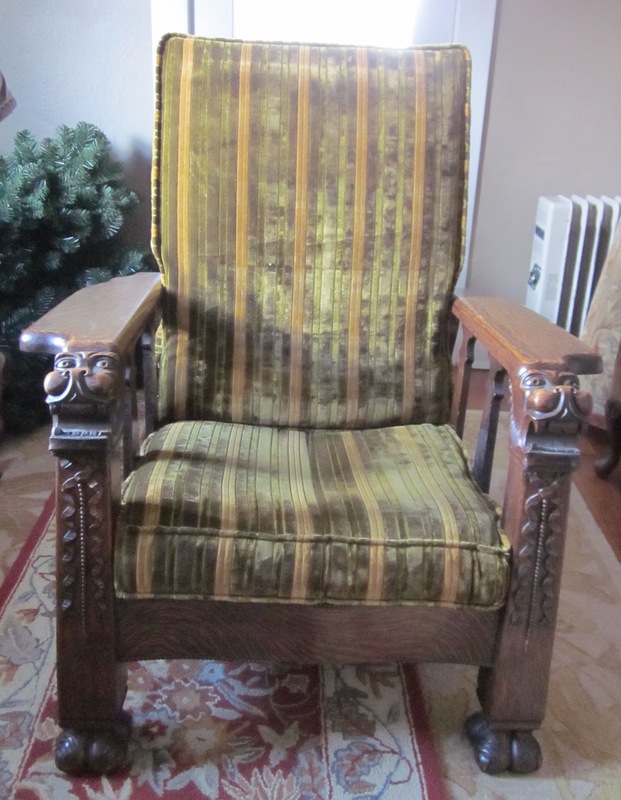 With our super crappy weather this spring preventing further work outside and staining the bathroom windows, I think I'm ready to take on our Morris chair upholstery project. We bought this chair nearly 4 years ago and it's too ugly in its current state to live on the main floor, so it's just been cluttering up our basement. Given how cool the carving is, that's a tragedy. 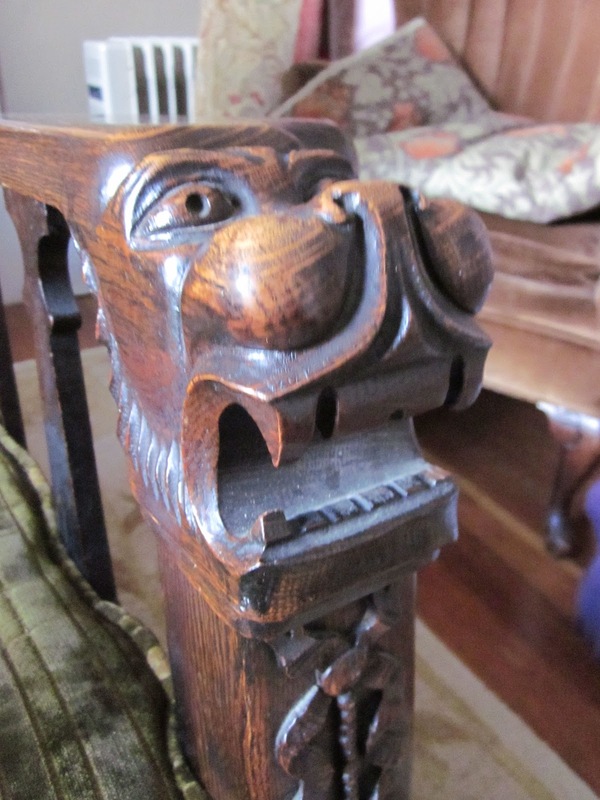 Looking back, we were way too enamored with the carvings and we spent too much money for the condition it was in. Oh well, lessons learned. I'm quite sure this poor chair has been the victim of a bad remodel. When you take off the seat cushion you find this. 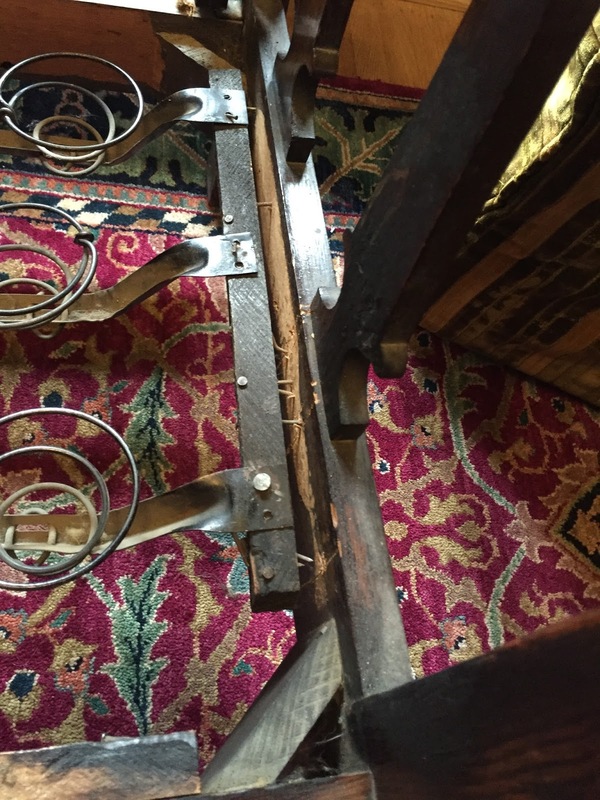 The cushion was just sitting directly on those strap springs, and the board the straps were nailed to is pulling away from the chair frame. Ugh. What a mess. I am sure the chair was not originally built like this. So, as usual, I applied myself to researching how to fix it. I did a lot of searching around on the internet and I found very little that provided clues as to how to fix this chair. 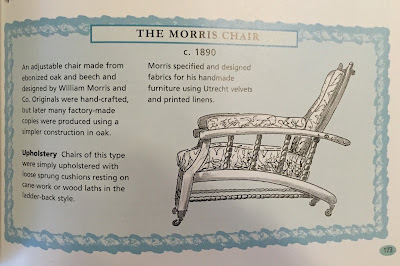 Often websites that talked about making Morris chairs spent all their time showing you how to make the frames and then skipped right to the end and showed you the chair all stained and put together with cushions covering up whatever structure they added to hold the cushion. So, I finally turned to my personal library. 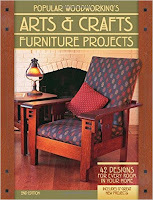 Like the websites I found, most books didn't bother to discuss how to provide a framework for installing cushions, but I did finally find two books that helped me decide how we should finish this chair. The Popular Woodworking's Arts & Crafts Furniture Projects book provided a good solution for how to finish a platform to set a cushion on. So, Jeff is going to make me a frame to put jute webbing on and it should sit on top of the braces in the corners. We'll also move those extra boards down until they are flush, for added strength. This book also included some more information about how to finish a cushion using foam to sit on this structure. 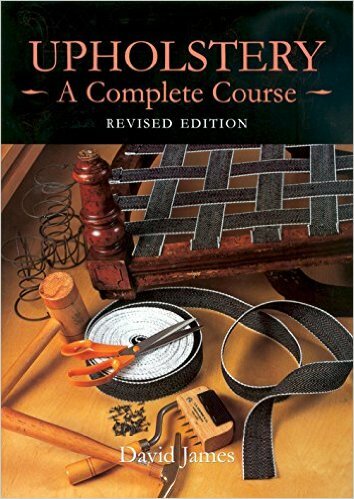 This was my plan until I found this entry specifically talking about Morris chairs in the Traditional Techniques chapter of my Upholstery: A Complete Course by David James. 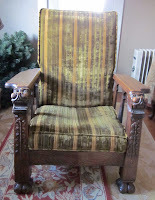 "Upholstery Chairs of this type were simply upholstered with loose sprung cushions resting on cane-work or wood laths in the ladder back style." I love this traditional method of making a cushion, so I'm going to go ahead and do it this way. The chair will be a lot more comfortable. I've found an online supplier that carries the spring units in the United States, so I'm going to go ahead and order one along with the cotton batting. I should be able to pick up anything else I need locally. As for the back rest, I think I'll still use some foam, but if I have cotton batting leftover, I'll wrap it in that. Have you tried this web site. This guy repairs Morris Chair maybe you can get parts if you need it. There is a picture showning how the spring are suppost to be. Thanks for that link. I think I did run across on of those pages in the past, but I didn't actually read it all so I didn't realize there were 4 pages. We are fortunate in that the hardware on the chair is still in workable order. It's just the seat that is in poor condition. It's interesting that this site only shows springs below the cushion. I found a couple of other options as well, including a cane woven base. 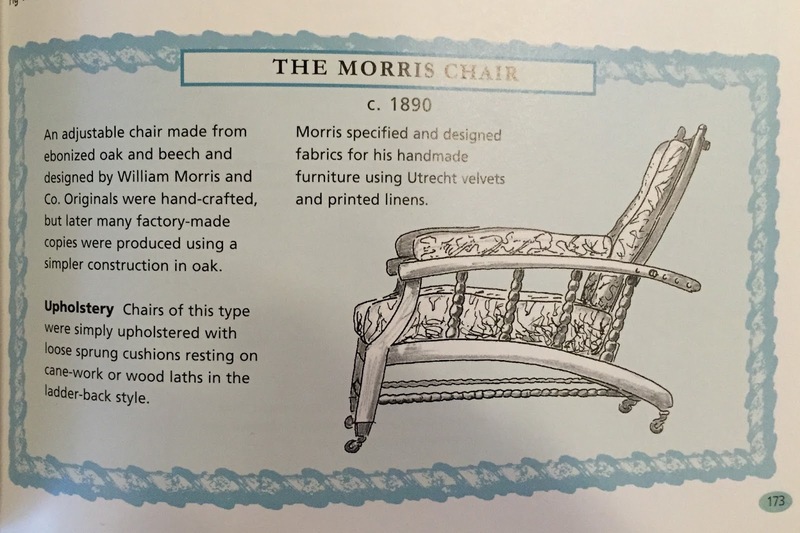 It does look like our morris chair may have been made by S.A. Cook. Thank you for this. Oh boy. Lots to digest here. First, I wonder if it's too late to convince you to NOT go for a sprung seat cushion. If it's too late, and you've already made up your mind or placed the order, then so be it. 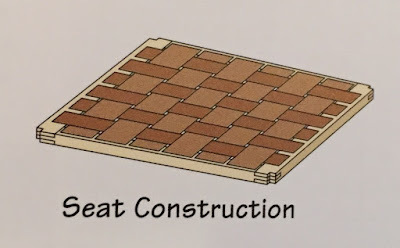 The reason I'd advise against a sprung seat is because they are simply not comfortable. 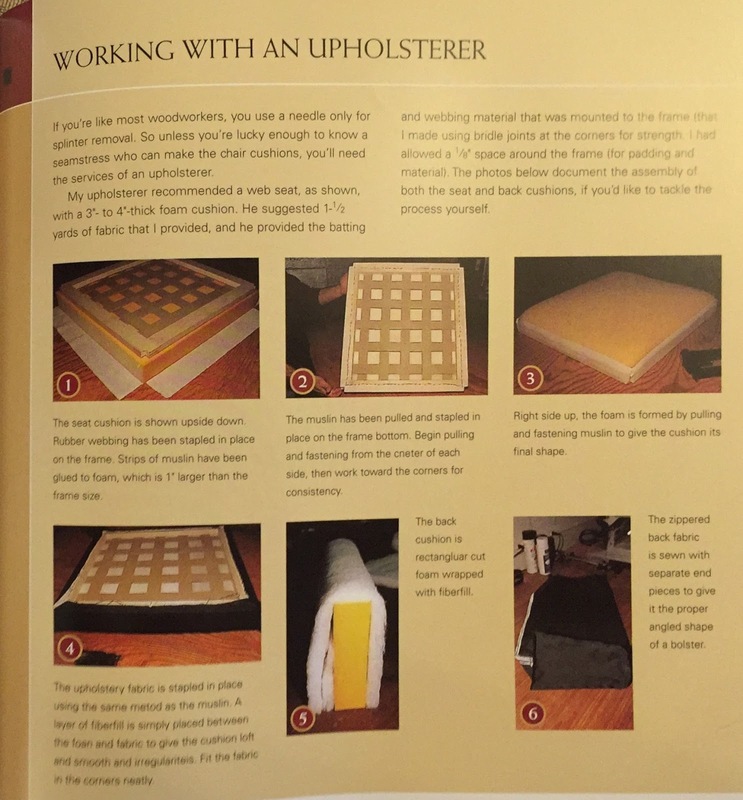 We've done a handful of jobs where we reused the originals (which are often a big mess of lumpy cotton and a sprung frame resembling a mini mattress), but in general, 95% of our clients opt to get rid of them and replace them with foam. Foam is a lot more comfortable, and it will keep a nice crisp rectangular shape. It's up to you, but just keep in mind that the sprung cushion will eventually get a bit lumpy. As for the sprung foundation, I think it might be original to the chair. 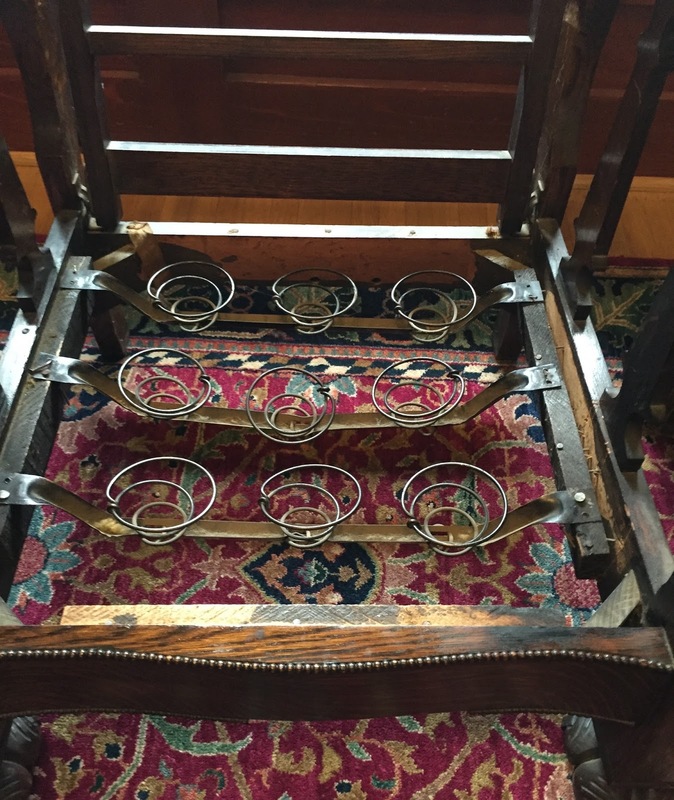 These chairs were made by several manufacturers, and this style of sprung insert on rails goes back to Victorian times. The wood rails all seem to match, and I don't really see any evidence of another system. If it originally had wood slats, you would see a rail or shadows where the rails used to be. 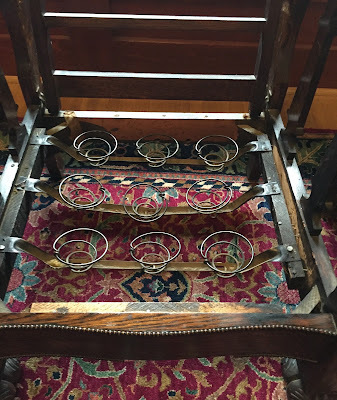 If it had webbing and traditional springs in the base, there would be LOTS of tack holes under the bottom rails (I'd be curious to see the bottom side of the chair). I do see extra tacks or small nails around the top, so it's possible that there was just a sheet of burlap over the springs to better support the cushion. The tops of the springs might have been hand tied to the burlap cover. Thanks for the advice. I will think about it. I guess I should have asked you earlier. When we bought this chair it had foam cushions that were hard as a rock. I do not know how long foam lasts, but I'm not sure it's long enough. In reality, I doubt this chair will get much use. We usually use the loveseats and those do have foam. The sprung cushion will certainly last a very long time (and it can always get replenished with fresh cotton batting), it's just not quite as comfy to some people. Some of the higher quality cushions will have coils in the middle, then a foam wrapping, and then a terylene wrap. I know this because my boss recently had to tear apart one of these high-end cushions to rip out the springs and fill the cavity with foam. If the chair will be mainly a show piece, then the level of comfort doesn't matter as much, and the coil cushion should be fine. Good quality foam is expensive (it's charged by the cubic inch). It generally lasts a good 20 years or so. It gets softer with age. A lot of customers bring in old softened cushions and we usually replace them with either firm or medium. The foam comes in many firmness levels (from very soft to hard as a rock).